This NASA file image shows the Hubble Space Telescope resting in the Space Shuttle Discovery?s cargo bay during a repair mission in 1999. Put into orbit at an altitude of 600 kilometers (360 miles) by the shuttle Discovery in 1990, Hubble has transmitted more than 750,000 spectacular images and streams of data from the ends of the universe, opening a new era in astronomy. The Hubble space telescope, the object of NASA's fifth and last servicing mission next week, is a veritable time machine that has revolutionized humankind's vision and comprehension of the universe. 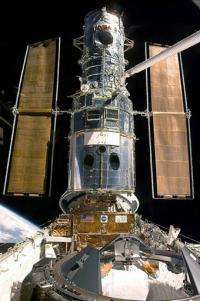 Put into orbit at an altitude of 600 kilometers (360 miles) by the shuttle Discovery on April 25, 1990, Hubble has transmitted more than 750,000 spectacular images and streams of data from the ends of the universe, opening a new era in astronomy. But the telescope, the fruit of a collaboration between NASA and the European Space Agency, had a troubled start and did not become operational until three years after its deployment. Its lense in effect had to be fixed because of a flaw in its shape, a sensitive operation that was not carried out until 1993 in the first shuttle-borne service mission, which installed corrective lenses. From that time on Hubble has transmitted stupefying images of supernovas, gigantic explosions that marked the death of a star and revealed mysterious black holes in the center of virtually all galaxies. Thanks to these observations, delivered with 10 times the clarity of the most powerful telescopes on Earth, astronomers have been able to confirm that the universe is expanding at an accelerating rate and to calculate its age with greater precision as an estimated 13.7 billion years. The universe's accleration is the result of an unknown force dubbed dark energy that constitutes three-quarters of the universe and counter-balances the force of gravity. The rest of the cosmos is composed of five percent visible matter and about 20 percent shadow matter or anti-matter. Among the other discoveries credited to Hubble figures the detection of the first organic molecule in the atmosphere of a planet orbiting another star and the fact that the process of formation of planets and solar systems is relatively common in our galaxy, the Milky Way. Hubble also has observed small proto-galaxies that were emitting rays of light when the universe was less than a billion years old, the farthest back in time that a telescope has been able to peer so far. The two new instruments that will be installed by astronauts on the shuttle Atlantis will enable Hubble to look out in time as far as 600 to 500 million years after the universe's birth with a big bang, according to NASA. "If we are successful HST (Hubble) will be more powerful and robust than ever before and will continue to enable world class science for at least another five years and overlap with (its successor) the James Webb Space TÃ©lescope/JWST," said Ed Weiller, associate director of NASA's research programs. Closer to home, Hubble has observed radical changes in the direction of Saturn's winds and revealed that Neptune has seasons. The telescope also has examined mysterious lightning flashes on Jupiter and taken astonishing pictures of Mars. This list of startling scientific discoveries have made Hubble "truly an icon of American life," said Weiller. "I maintain that if the average American knows only one science project, one science instrument, I bet it's Hubble," he said. "Hubble has become a standard in any astronomy book in many languages," he added. to calculate its age with greater precision as an estimated 13.7 billion years. I think this qualifies as public relations. Not news. Belongs in a nice coffee table science magazine. Not here.